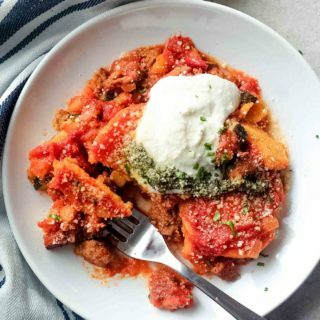 Now that we’ve tackled all the ins and outs of cauliflower pizza crust, it’s time to top it with something amazing. 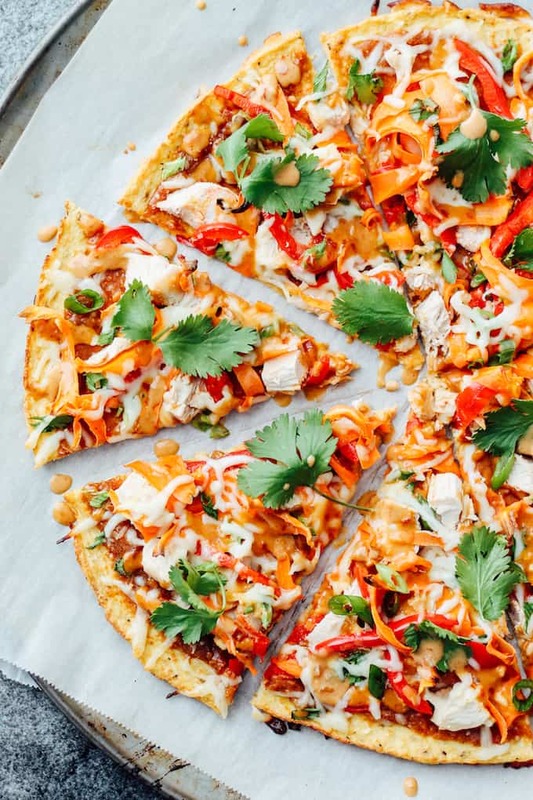 Of all the topping combinations I’ve tried with cauli crust, Thai chicken pizza, with all of its glorious fresh veggies, cheese, and tangy peanut sauce, is one of my favorites. 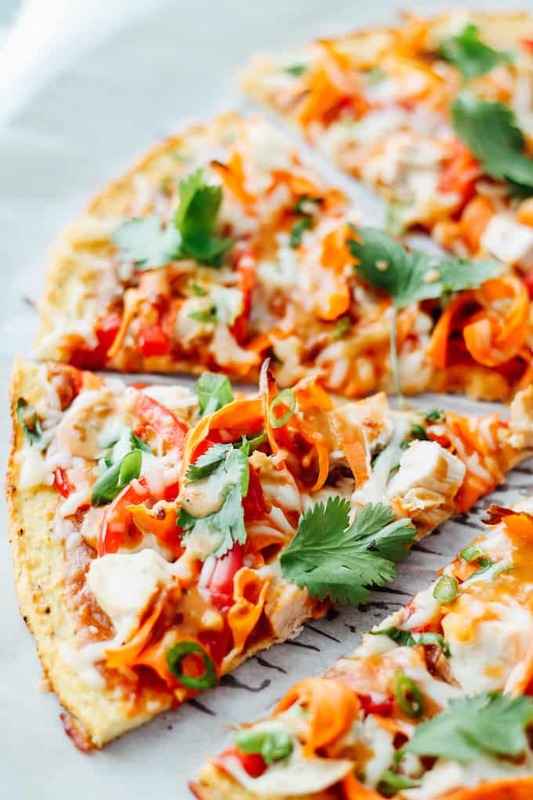 You’re seriously going to devour this Thai Chicken Pizza with Cauliflower Crust! As I mentioned in the cauliflower crust post, it’s best to prepare all of your pizza toppings while the crust is pre-baking in the oven. 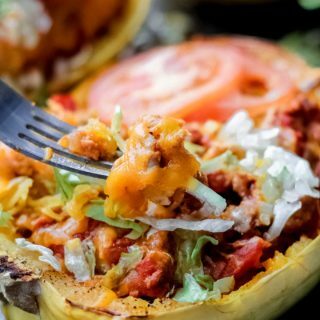 Aside from preparing the cauliflower crust, your first step is to make the peanut sauce, which will take the place of your traditional red pizza sauce. 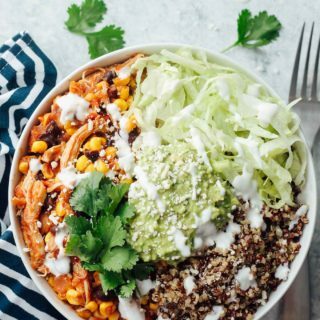 Whisk all the sauce ingredients up in a bowl. 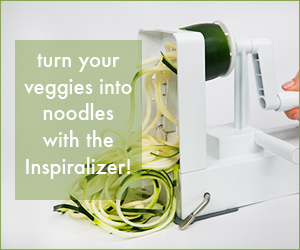 No need to bring out the blender or food processor. One cooked chicken breast, chopped into small chunks. Buy pre-cooked chicken to make life easier! 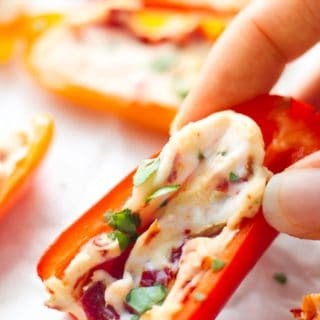 One thinly sliced bell pepper. Any color will work. Shaved carrots for a little crunch and to add some pretty orange spirals to the mix. Mozzarella cheese. 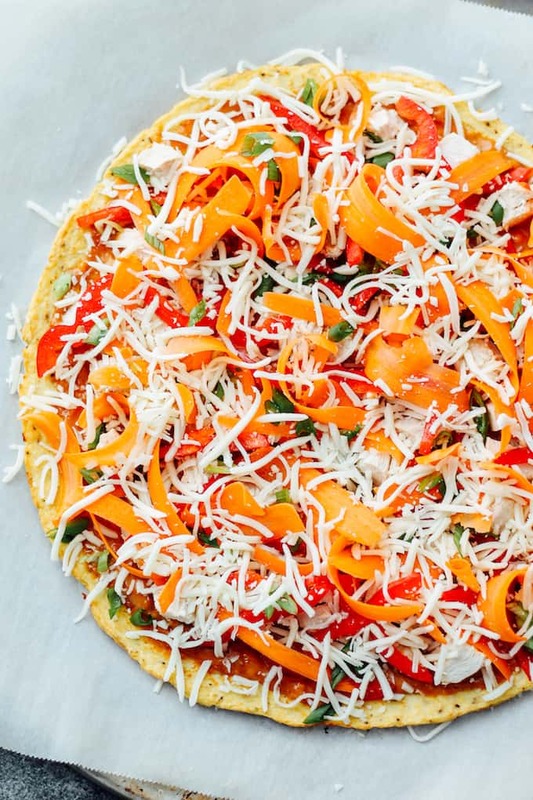 Cheese may seem weird on an Asian-inspired pizza, but the mellow-flavored mozzarella melted on all the veggies brings all the flavors together into one beautiful bite. 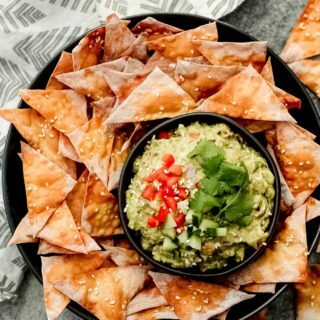 If you’re dairy-free, you could definitely skip the cheese! Cilantro to add a finishing touch of freshness. 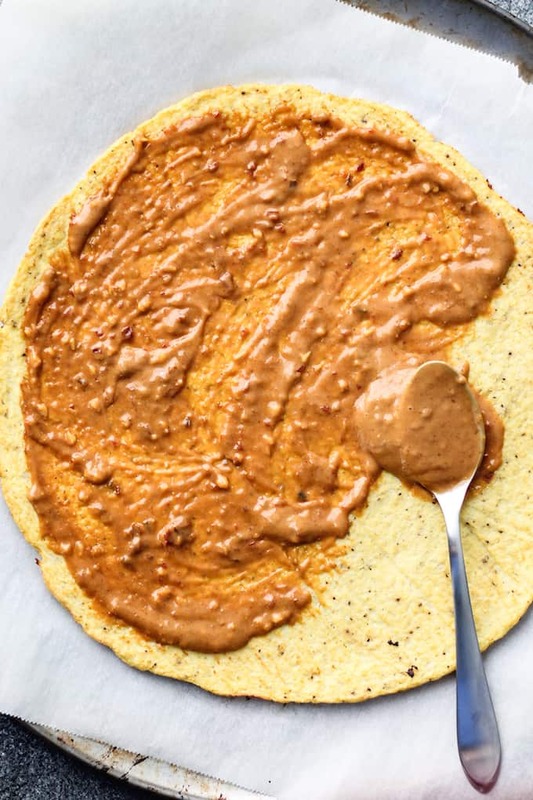 Once the cauliflower crust comes out of the oven, slather a thick layer of peanut sauce over the top, but remember to reserve about 1/3 cup for a finishing drizzle. With the peanut sauce in place, it’s time to pile on the toppings in no special order or fashion. The pizza is done in about 8 minutes once the cheese is melted to your liking. I personally like my cheese in the gooey, stringy stage just before it starts to bubble and brown. 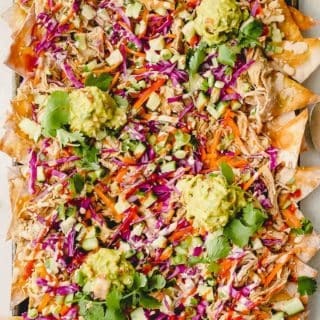 Last steps are to drizzle the extra peanut sauce over the top and throw on some fresh cilantro leaves. Before digging in, I’d recommend letting the pizza sit for about 5 minutes to cool so all of the ingredients get used to each other. 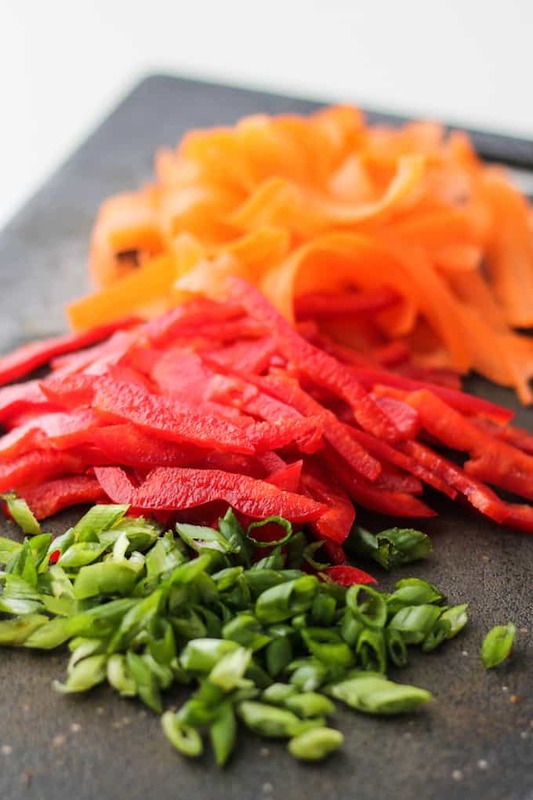 If you slice too soon, the veggies may scatter, leaving some pieces with bare crust. A common question about cauliflower pizza crust: Does it hold up well enough to pick up a slice and eat it with your hands? Initially yes, the crust is sturdy enough. But eventually the crust may become a little floppy. If there are any leftovers, expect to use a fork the next time around. So there you have it! 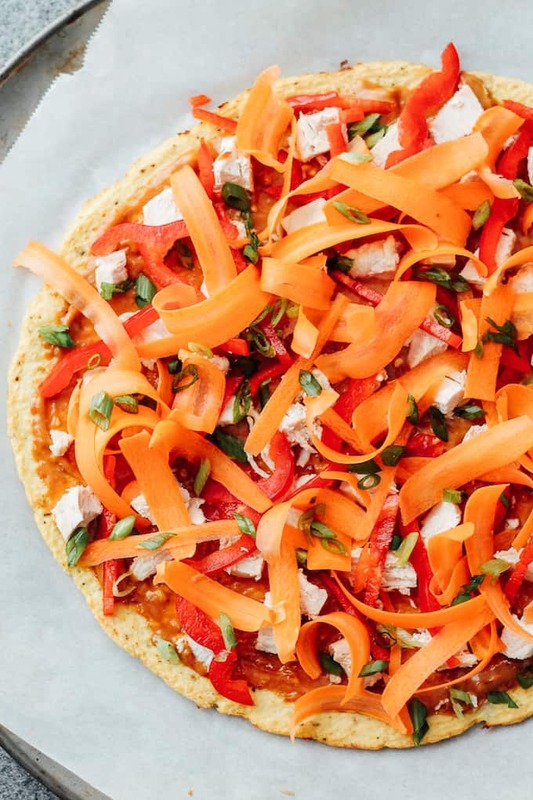 Healthy cauliflower pizza crust with a seriously tasty way to top it. 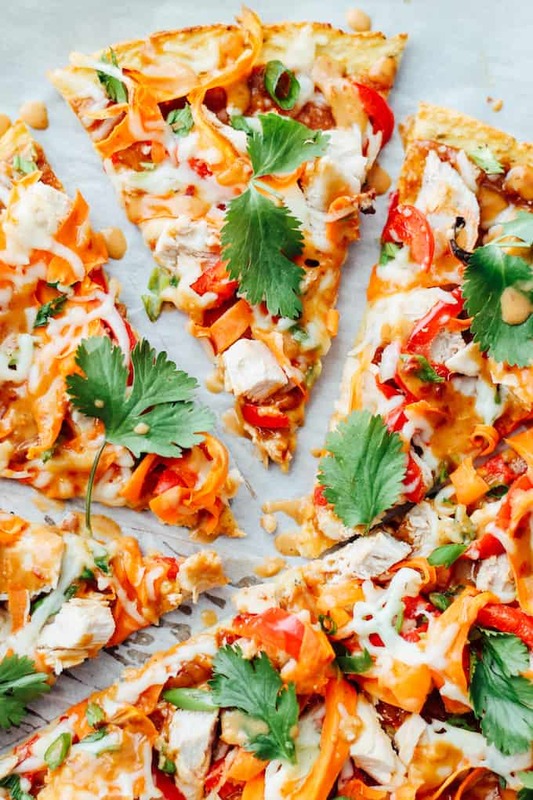 I hope you love this guilt-free crust and the Thai Chicken Pizza as much as we do! Prepare the cauliflower pizza crust. Make the peanut sauce: In a bowl, whisk together all of the peanut sauce ingredients until smooth. Pile on the toppings: Spread a thick layer of peanut sauce over the crust, but remember to set aside about ⅓ cup for drizzling. Top with chicken, bell pepper, carrots, green onions, and mozzarella cheese. Bake: Bake the pizza for 8-10 minutes until the cheese is melted to your liking. Drizzle the remaining peanut sauce on top of the pizza. Sprinkle on fresh cilantro.